Tibbo, P., Crocker, C. E., Lam, R. W., Meyer, J., Sareen, J., & Aitchison, K. J. (2018). Implications of cannabis legalization on youth and young adults. The Canadian Journal of Psychiatry, 63(1), 65-71. Why support a separate medical access framework for cannabis? Cairns, E. A., & Kelly, M. E. (2017). Why support a separate medical access framework for cannabis?. CMAJ, 189(28), E927-E928. Wettlaufer, A., Florica, R. O., Asbridge, M., Beirness, D., Brubacher, J., Callaghan, R., ... & McKiernan, A. (2017). Estimating the harms and costs of cannabis-attributable collisions in the Canadian provinces. Drug and alcohol dependence, 173, 185-190. Allen, S., Stewart, S. H., Cusimano, M., & Asbridge, M. (2016). Examining the relationship between traumatic brain injury and substance use outcomes in the Canadian population. Substance use & misuse, 51(12), 1577-1586. Hajizadeh, M. (2016). Legalizing and regulating marijuana in Canada: review of potential economic, social, and health impacts. International journal of health policy and management, 5(8), 453. Asbridge, M., Mann, R., Cusimano, M. D., Trayling, C., Roerecke, M., Tallon, J. M., ... & Rehm, J. (2014). Cannabis and traffic collision risk: findings from a case-crossover study of injured drivers presenting to emergency departments. International journal of public health, 59(2), 395-404. Lynch, M. E., & Campbell, F. (2011). Cannabinoids for treatment of chronic non‐cancer pain; a systematic review of randomized trials. British journal of clinical pharmacology, 72(5), 735-744. 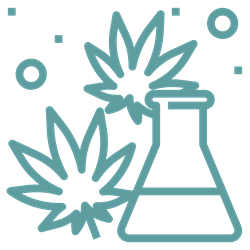 View PubMed results for local cannabis research. Check out the Find Articles page for customized search strategies developed by your librarians to help you retrieve focused results about cannabis in databases such as PubMed, EMBASE, CINAHL and PsycINFO.